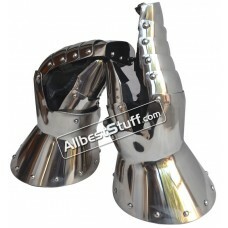 Allbeststuff Medieval Gauntlets are fully functional designed to ease the Viking warrior performance in the battle field. 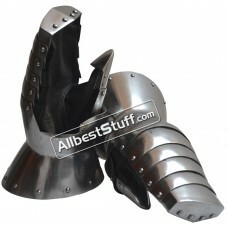 We have a wide range of Medieval Gauntlets made from 14 to 20 Gauge steel. 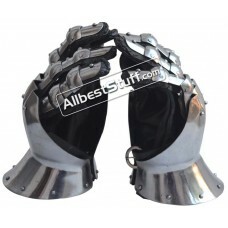 The Mild Steel gauntlets require little care to avoid rusting so keep it oiled when not in use for longer period. 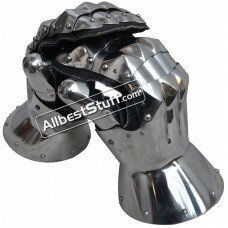 We also offer rust proof stainless steel gauntlets so you do not have to worry about the maintenance as well as strength since both Mild Steel and Stainless will offer full protection to your arms and wrist. Wear it over your chain mail or match it with your existing plate Armour. 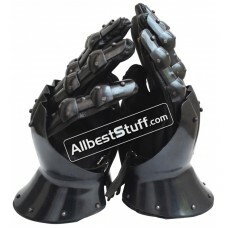 Allbeststuff offers gauntlets in two different styles, the mittens type comes with protective plate over the upper part of hand and fingers while the regular ones comes with individuals fingers protection. All our gauntlets have stitched inner leather gloves which provides comfort to hands, the color of leather gloves can wary from the listing pictures depending upon availability and if you have any concerns in choice of leather gloves color, please do write us for clarification. 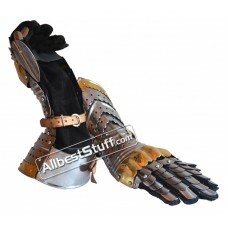 Most of our gauntlets are also available in choice of finish to relate closely to several medieval Era. Get a Natural, Buff or Blackened finish for your gauntlets. The bid doesn’t stop here, if you have an explicit requirement in Design, Style, Thickness, and Material for a small or larger group, let us know & we will be happy to offer a competitive price for custom made gauntlets. Made from 16 Gauge Blackened steel covering hand a..
Hourglass Gauntlets Made from 16 Gauge steel cover..
Made to provide utmost flexibility when worn over,.. Flexible and easily wearable and perfect combinati.. 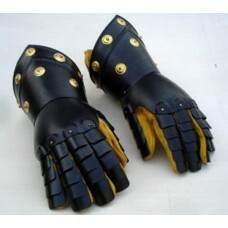 These fully functional gauntlets are crafted from .. These fully functional are crafted from 16 gauge s..